Assocomaplast (the national trade association, member of CONFINDUSTRIA, including over 160 manufacturers of plastics and rubber processing machinery, equipment and moulds) has developed ISTAT foreign trade data for the sector in the first half of 2016 and compared them with those for the same period in 2015. The data show imports at nearly 390 million euros, with a new peak (+9.7%) deriving from steady growth in April-June after a negative first quarter. This would seem to reaffirm the signs of recovery in the domestic market that had shown up on the radar last year. The trend in exports this year, on the other hand, was much less impressive: excluding the data confined exclusively to the month of January, which were not particularly significant, the bottom of the trough was seen precisely last June at -2.3%, following months of foreign sales dropping by -0.5% to -1.0%. The result is a weakening in the positive trade balance, which did not reach one billion euros. Asia is also a bright spot, thanks to increased sales in the Far East – China, India, South Korea and Vietnam – and, as regards the Middle East, to the much awaited recovery of sales in Iran. Breaking things down by machinery/equipment type and limiting the analysis to the categories having the greatest weight on the total while ignoring the more heterogeneous ones, the biggest increase was seen in the importation of moulds, mainly from Germany. 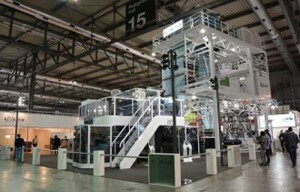 An increase was also observed for injection-moulding machines, which were primarily purchased, and in greater numbers than in the previous year, from Austrian and German manufacturers. Germany, China and Austria, in that order, are once again the main suppliers of technology to Italian processors; while European suppliers have consolidated their positions with double-digit increases, China recorded a limited +2%.  extrusion machines (+1.9%) have shown a clear increase in sales to Mexico and to France. The ISTAT data are confirmed also by the recent Assocomaplast sentiment survey of a sample of processors, who report recovery in domestic and slowdown in foreign demand, and among its members, who show a trend toward stability in orders, especially from foreignmarkets, a situation that is expected to continue to the end of the current year. In parallel, we observe that competing German manufacturers closed out the first half of 2016 with substantial stability in imports and exports, recording positive variations on the order of tenths of percent. It is worth noting that the Italian presence at the three-year German fair will be second only to that of the hosts, with some 400 exhibitors, over half of them manufacturers of machinery, equipment and moulds, many of whom are members of Assocomaplast. The association will be there with its own stand (n. 16-A56), which will distribute MacPlas magazine and information on the Italian plastics and rubber industry, and provide a catering service for guests and associates. The Assocomaplast stand will also be an exhibition venue for works of art by the artist Lady Be, who creates portraits using small pieces of discarded plastic. The fair will also mark the official opening of the promotional campaign for PLAST 2018 (Milan, 29 May – 1 June 2018).